Movie night was a huge success. We haven’t had that many models on the contest table in a long time. And not only were there a lot of entries, there were a lot of incredibly well done entries. Judging wasn’t an easy task. In the end it came down to two winners, as it always must (well, not always, but there were only two prizes up for grabs). 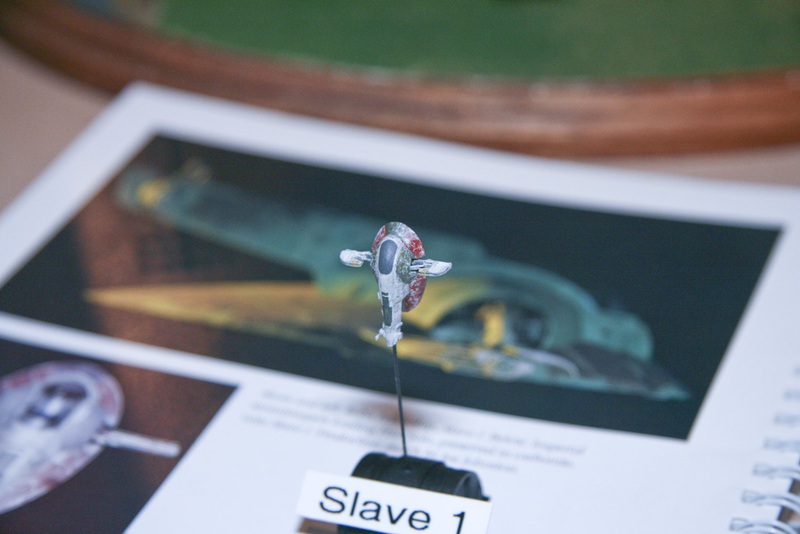 First place went to John Bucholz with his scratch-built Slave 1 from “The Empire Strikes Back”. I’m not sure of the scale of the model, but it was no more than an inch from top to bottom, and consisted of over 100 parts. Stunning work. Second place went to “Big Bill” Schwarz and his Bruce diorama, from the movie “Jaws”. Bill took the great white kit model from Pegasus and modified it to a surface-broaching appearance, and then put the kit’s diver figure in the mouth — and in the water (basically, it wasn’t a good day for the diver). Next month is Russian Night, November is WWI Night.